Wouldn’t it be great if your document management software allowed the time saving convenience of emailing documents to your customers and colleagues when in a hurry? 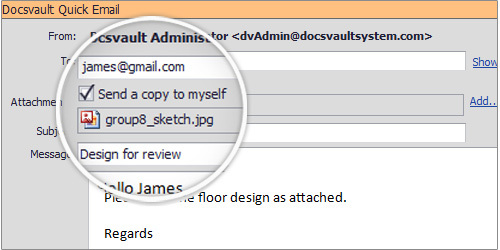 Docsvault’s quick email feature allows you to email documents in a snap with simple right click simplicity. Quick Email allows you to share documents from within Docsvault via email. This feature helps save time, and bother of going to Outlook or any such email clients, composing a new mail, adding attachments and then sending out the email. Administrators can enable or disable the Quick Email feature at any time.In organizations where this feature needs to be allocated selectively, emailing of documents can be controlled by the export security right. Simply select the document you want to email and send it via Quick Document Emails. You can also add more documents to the same email as there are no limitations to the number of documents you can send via Quick Email. Send documents for reference directly from the repository while still on the phone. An average employee sends and receives more than 200 emails a week; Quick Email can be quite a time-saving tool for those who need to email regularly. Simple document based task management functions to ensure smooth processes and improved productivity.